Allah Hu, Allah Hu, Allah Hu! Only You, Only You, Only You! - From a famous Sufi Qawwali "Allah Hu"
The present lunar month, Rajab marks a supra-ordinary incident in the life of the Seal, Muhammad Mustafa which is known as the M’iraj or Ascension. On this particular night an extra-ordinary mystical journey occurred where the beloved Ahmad was taken in the most intimate presence of his Lord, the possessor of the Name, Ahad. (Ahmad is another name of Muhammad, Ahad is a Name of God, which means One). Such intimacy was never granted to anyone else in the entire creation, neither to any angels nor to any messenger before him. The mystical letter meem that separates Ahmad from Ahad became effaced to the point that the two were “two bow or nearer”. And two bows when brought nearer and nearer becomes a full circle, symbolizing totality. This was an incident of Lover and beloved coming together and language fall short in describing its majestic reality. 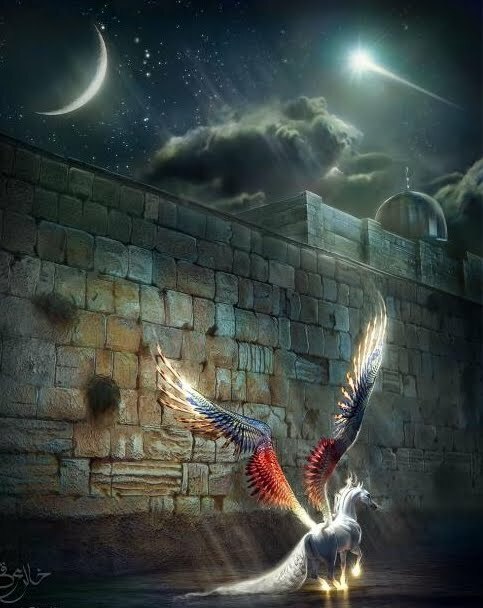 Many ‘Signs’ of his Lord was unveiled on this night as the Seal journeyed on the celestial carrier, Buraq. 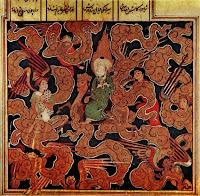 Accompanied by blessed archangel Gabriel, Muhammad Mustafa met different messengers in different heaven: in the first heaven he met Adam, in the second heaven he was greeted by John the Baptist and Jesus, in the third heaven he met Joseph, in the fourth heaven Enoch, in the fifth heaven Aaron, in the sixth heaven Moses and finally in the seventh heaven Abraham. Each messenger of God and their place in heaven represents a level of realization which must be attained in the ascent to God. "My Glorious Lord said to me, 'I gave My friendship to Abraham, and spoke to Moses, and O Muhammad! I blessed you with My Intimate Meeting"
"Verily, Almighty Allah blessed Noble Moses with the privilege of Dialogue and cherished me with his Divine Vision and exalted me with the Crown of Intercession and the Fountain of Kauthar." The incident is so enshroud by unspeakable mysteries that Ibn Arabi wrote: "Me'raaj is a secret in a secret. One has to have sound knowledge of the Qudrat of Allah and the Station and Status of His August Divine Messenger before commenting on any matter pertaining to them." The sublime event was essentially an answer to the call of Prophet’s love for his Lord in which the Prophet was granted the most intimate experience, the experience of looking at his Lord and conversing with Him without any veil in between them. Apart from being the direct and intimate Presence of his Lord, seeing the greatest Signs of God, being shown the heaven and hell - on his return the Prophet brought back with him the prescribed prayer of Islam called Salaat. 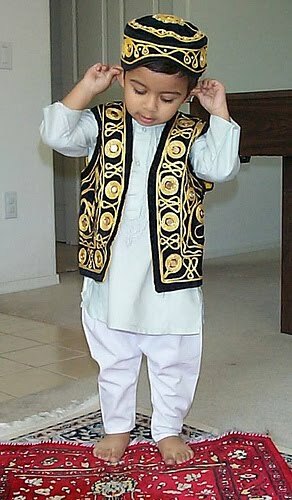 Its known that the movement of the Salaat incorporates different ways of other messengers, how they prayed to the Lord. Some of these illuminated beings used to pray standing, some bowing, some on their face on the ground (prostration) and some in combination. The Salaat is a culmination of all. Also the prescribed time of the prayer which syncs with the rhythm of the day and night is also a practice of awareness from one moment to another. For the muslims the benefit and secrets contained in the Salaat is innumerable. It has the ability, among others, to raise awareness, sharpen the witnessing part of the self, produces single pointedness of the heart, bridge between conscious and subconscious part of our being more active through supplication and purification of the mind through holy remembrance. in the prayer should be with you always..
“The nearest a servant of Allah comes to his Lord is when he is prostrating”, that is, during the sujood, "so make supplications in that state." In the beautiful book, The Illuminated Prayer: The Five-Times Prayer of the Sufis Coleman Barks, Michael Green writes, "No single word in English does justice to the Arabic word Salaat - it is "a devotional heart-surrender" that incorporates prayer, supplication, grace, and blessing. " Barks, the poet, writes: "Like a waterwheel that ceaselessly catches water out of a stream and spills it into a garden, The Prayer lifts us up again and again out of our preoccupations and sets us into a sacred time." Five times a day, Sufis bow before the boundlessly merciful and boundlessly compassionate God. The Call to Prayer, the Ablutions, The Prayer itself, and the Peaceful Embrace afterward - they help us appreciate the devotional life of Sufis whose spiritual practice of reverence is awesome. Only in embracing all can we become the arms of God. Surely that is the essence of all worship and the lure of all serious prayer. And all of the components of the Salaat the Prophet brought back from the experience of Ascension. 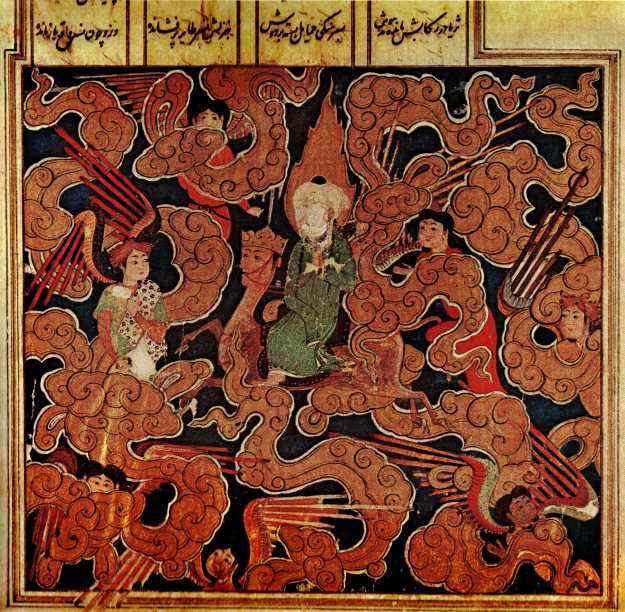 According to tradition and testimony of Sufi mystics, The Prayer - or Salaat - was first taught by the angels, who themselves practiced it in celestial adoration. 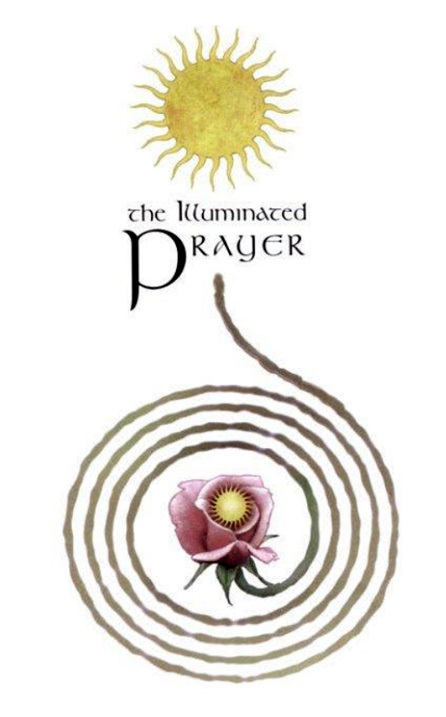 The Salaat is God's gift to all humankind, an archetypal practice that unfolds like a fragrant, many-petaled flower, joining words and movements into a single luminous event that engages our entire being. Muslims recognize these words, for they speak them during the time they sit up after every two rak’as (cycle) of prayer inside the Salaat. 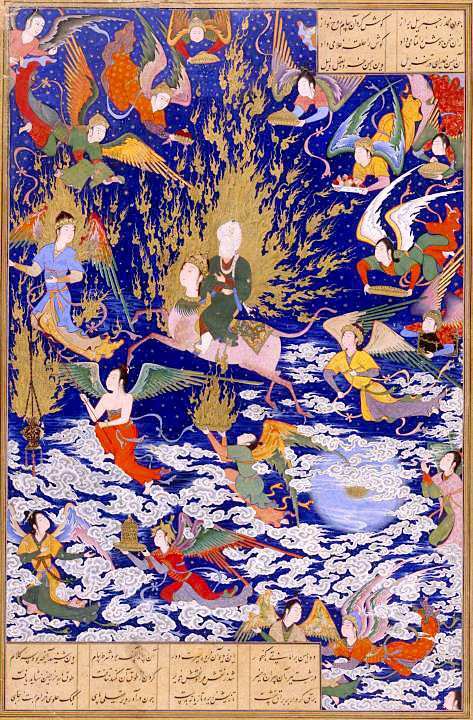 It is said that the rest was also spoken during the Ascension: that the Messenger of Allah said, “I bear witness that there is no divine reality but Allah” and that Allah Most High replied, “And I bear witness that Muhammad is the Messenger of Allah.” Thus in the salaat, the dialogue between Allah and His Messenger during the mi’raj coincide. Allah, Almighty and Sublime be He, has said: I have divided prayer between Myself and My servant into two halves, and My servant shall have what he asked for. When the servant says: Bism Allah ar-Rahman ar-Rahim, Allah says: dhakarani abdi (My servant has mentioned me). And when he says Al-hamdu lillahi rabb al-’alamin, Allah says: My servant has praised Me. And when he says: Ar-Rahman ar-Rahim, Allah says: My servant has extolled Me, and when he says: Maliki yawmi d-din, Allah says: My servant has glorified Me. And when he says: Iyyaka na’budu wa iyyaka nasta’in, He says: This is between Me and My servant, and My servant shall have what he asked for. And when he says: Ihdina as-sirat al-mustaqim, sirat al-ladhina an’amta alayhim ghayr al-maghdubi alayhim wa la ad-dallin, He says: This is for My servant, and My servant shall have what he has asked for. Thus we have our own dialogue with Allah most High during our mi’raj, our Salaat. Now the Qur’an commands us to recite the Qur’an in the form of tarteel, or to pause between the verses, and the great scholar Ahmad ibn Idris emphasizes the importance of doing this during the Fatiha in the Salaat, saying “Stopping at the ends of the verses is for the sake of his Lord’s reply, and that is because for the servant to start saying the next part before his Master’s reply to his first speech is ill-mannered (lack of adab).” So when reciting the Fatiha in the Salaat one must be conscious of Allah’s response to what one is saying, and that one is in holy communion with the Divine. Our ascension, our journey to Allah, begins with the first takbir, when we raise our hands above our shoulders in a movement that many scholars have likened to that of the throwing off of a garb. As if you are saying, Allahu Akbar, God is Greater than this world, which I throw behind me; God is greater than all worries and distractions, which I throw behind me; God is greater than the ego that does not like to obey commands or to prostrate itself, and so I throw it behind me; God is greater than myself, so I leave it behind me. And thus begins your journey, your mi’raj, in which you get as near as possible to Allah, and act out parts of the Messenger’s own mi’raj. Then, you return to the world, and you say to those around you, whether human or angel, what every traveler says upon his arrival, you greet them with Assalamu alaykum wa rahmatullahi wa barakatuhu, the Islamic greeting formula: Peace be upon you, and Allah’s mercy and blessings. The Takbirat al-Ihram for the Salaat (The commencement of Salaat by saying Allahu Akbar): It is that he who is praying forgets everything except Allah and swims in the Kibriya’ (Majestic Exaltedness) and Greatness (of Allah). Then every time he reaches an end of Kibriya, Allah is even greater in exaltedness above that, and so he renews the takbir in the Ruku’ (bowing) and says: God is Greater, meaning Greater than the end I have reached while swimming in his Kibriya; and it is like that until the middle of prayer. At that point, your inability to swim in a creak from the oceans of his Kibriya is verified, so you return (to the beginning). Then at the end of the prayer you return to Creation and so you say: “Peace be upon you and Allah’s mercy”, for the greeting is not said except by someone returning from a journey. As for someone who has been present, for him to turn to his right and say “Peace be upon you” and then turn to his left and say “Peace be upon you”, that would be considered insanity, because that is not required of him by the law. And so the Salaat is a journey of Witnessing, a journey of Nearness, a journey of Divine Address- a journey to Allah and then back again to the world of Creation. Ritual prayer begins with a ritual cleansing, wudu. On the external level, wudu cleans the body, emphasizes the importance of hygiene and physically prepares one for prayer. If water is not available however, wudu can be performed using sand or touching a clean surface of a wall. The point here is that, internally, wudu is about holding a conscious intention to be pure (i.e. clean, clear) of negativity in mind, heart and body before formally coming into relationship with God. This intention is amplified by the conscious turning toward Mecca and the declaration of one’s intention, niyah or purpose for praying, without which the prayer would be rendered meaningless. Such self-directed actions align mind, heart and body, and affirm our interconnectedness with Spirit and Earth. This alignment serves as a spiritual fulcrum around which our life experiences orient, and a ground in which to come into relationship with the Earth. A fulcrum is a still point that organizes motion; it is a state of balance from which we can come into relationship with Divine Forces. 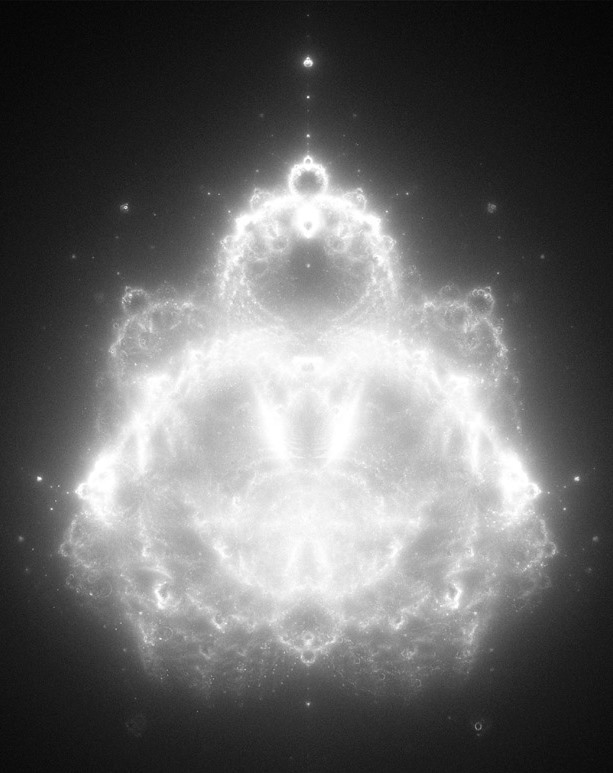 Fulcra are found in all forms of Creation; from the primordial midline to which embryological life forms orient, from quantum fields organized around a neutral zero point to planetary nebulae organized around fulcra of light. We are all derived from fulcra. "I take refuge with Allah the All-Merciful from the rebellion and negativity of the evil one. In the name of Allah Most High - Who is Tenderly Compassionate, Infinitely Merciful - Perfect praise flows to Allah alone, Lover and Sustainer of all Worlds, Most intimately called the Tenderly Compassionate the Infinitely Merciful, Presiding magnificently over the Day of Divine Awakening. O Lord, we worship only You and rely upon You alone. Reveal Your Direct Path, the mystic way of those who, through Your Mercy, have received and truly assimilated Your sublime Guidance, Those who never wander from the spiritual path and therefore never experience Your awesome Correction." 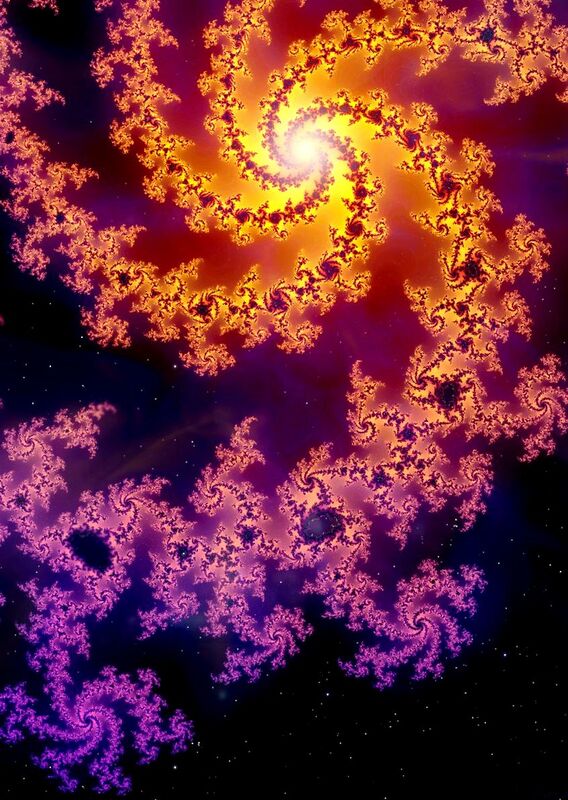 Prayer and meditation may orient our minds to Source, but remembrance takes place in the heart. 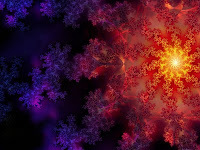 The fulcrum of the heart dynamically balances the energies of mind and body and opens us to the deeper truth of our interconnectedness with Cosmic forces. The heart is a resting place that opens to an inner dimension - “the secret place” of the Sufis: a Dynamic Stillness wherein God resides. Sufis understand with the heart what cannot be understood with the head. “How silent it has become in the house of the heart! Turn toward that which transcends direction. Tonight (8th July, 2010, based on sightability its on 9th July) sundown is the Night of Glorious Miraj. the Night of Holy Ascension. It falls on 27th Rajab of the lunar calendar. Most importantly this is a powerful time, a time with special energy that flows in the cosmos to attract remembrance and to renew the aspiration (himmah) for our self's ascension to the Divine Presence. May our Salaat, be made beautiful and complete - may it be perfected as our own ascension to the Lord of Majesty and Glory. May every salaat we stand be made more intimate and sweeter than the previous one, as we never know when the call from our Lord will be and which prayer be our last prayer on this earth standing before Him for the last time before the awesome awakening on the Day of Resurrection. Indeed we belong to Allah and indeed to Allah we return. None is our goal except Allah.